The game is still quite new and players are still trying to discover how the game works exactly. Well Love.Wolf and Wakaka took it a step further and actually did some experiments on attack priorities. The wiki (http://hackersthegame.wikia.com/wiki/Attack_Strategies) explains the attack priorities quite well. 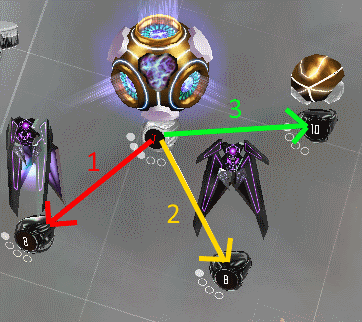 In this guide I will mostly explain the linking order mechanics and the different node types to better explain the wiki article. Why is this in the network architecture section? So that we can understand what nodes will be attacked first when the attacker has multiple nodes to choose from. With this knowledge, we can start baiting with nodes and know exactly which nodes will be taken down in which order. Before we get started on priorities, there is an import factor that we must explain first. That is: The order in which you link your nodes matters. Each link is very important as it determines which nodes will be attacked first (after some general rules). Firstly, here's how you know which link is which. That's the first link made. That's the second link made. That's the third link made. Keep the link numbers in mind throughout this guide as they play a big part in priorities. Partial AV (anti-virus) passive nodes. These are passive nodes that are half black because the AV is getting uploaded. 1) The Order you link nodes is what determines the order the nodes are attacked. 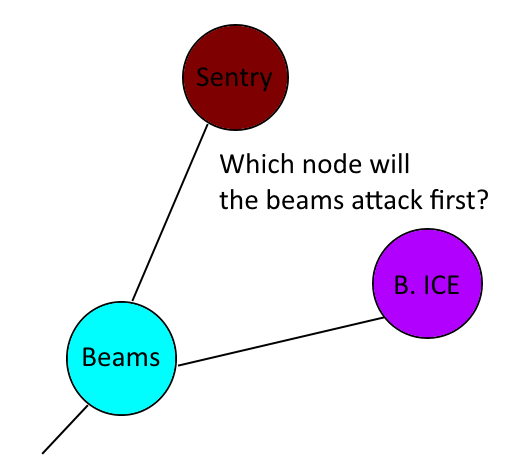 2) Defensive nodes (Black Nodes - Sentry, Black Ice, Turret) will always take priority over Passive nodes (White Nodes). 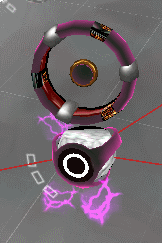 3) Passive Nodes with AV (turned Black) will take priority over normal passive nodes (White Nodes). 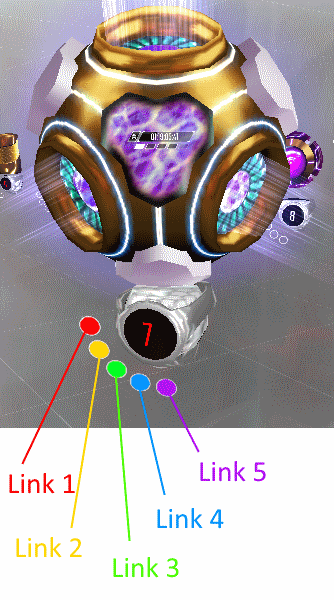 4) Passive Nodes with Partial AV (Partially Black) will take priority over normal passive nodes (White Nodes). 5) Passive Nodes with AV are NOT treated as defensive nodes. 6) Wraithed and Upgrading nodes have the lowest priority always. The only thing incorrect here is the upgrading nodes part (yet to be updated). Upgrading nodes have no effect i.e treated as what they would normally be without the building thread. Lada aka LadTy (in discord) wrote: "Wraithed and Upgrading nodes have the lowest priority." - im not actually sure about it wraithed yes upgrading idk, maybe it's just that these dont get filled up by AV (for the passive ones) which makes them attacked last." Now that we understand how attack priorities work, we can understand exactly how our base is going to get attacked. Now we can set up traps, tanking nodes and baiting nodes with full confidence. This discord group for coming up with this idea and supporting it: https://discord.gg/qquYZ6H <-- join us! Last edited by Fluffington on Mon Nov 21, 2016 1:28 am, edited 1 time in total. Oh wow, didn't know linking order had anything to do with this. Sentry not always being highest priority is also surprising. Thanks for testing all of this stuff guys. Yopee wrote: Oh wow, didn't know linking order had anything to do with this. Sentry not always being highest priority is also surprising. Yeah the guys spent a couple of hours testing this. And whilst linking order priority was known, it was generally believed that level, firewall and sentry still had some sort of priority as well. Testing on sentry was covered by number of tests. With the AV still speading on other linked nodes and AV not spreading, but the link order still overrode the sentry. If I'm honest. I don't like link order playing a part on so many different types of nodes. I would prefer if individual nodes had a priority. And link order only applied to nodes of exactly the same type. Silken wrote: Testing on sentry was covered by number of tests. 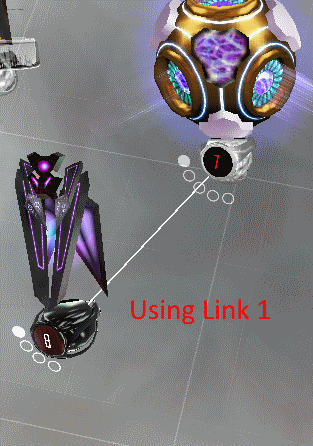 With the AV still speading on other linked nodes and AV not spreading, but the link order still overrode the sentry. This was the part I found interesting, AV having an effect on white node priority, but not changing security node priority. This kinda puts paid to my suggestion of Turrets and ICE showing as grey bases as standard, then black when they have AV installed. Still, I hope this theory stands up to scrutiny. It's a game changer for sure. For me the biggest game changer is understanding the priority on the white nodes. 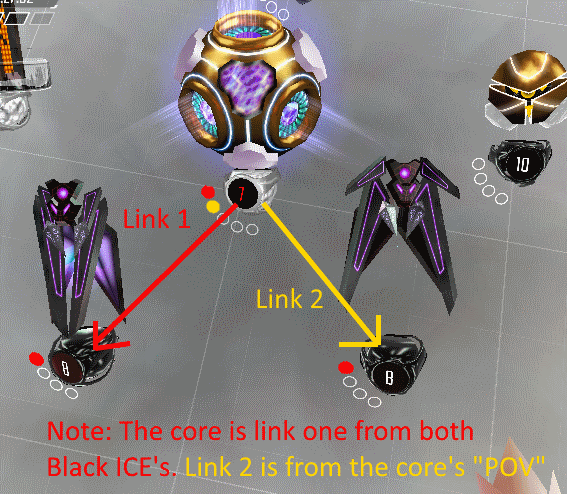 I mean the black nodes you always want the black ice not to be attack first. So it has more time to break a shield. Nothing really changes. But now we know how to focus an attac on a code gate. Effectively you can put s code gate of to the side at a dead end. Which you would never do before. But now we know how to force an attack onto it. Choke points on gates have just become so much more powerful. I need my gates to stop stealth, but once I have 4. It's going to be fun. Thank you so much for all this info! What's the attack priority of the core in this list? I would this it's a white passive node, but it doesn't seem to behave that way. 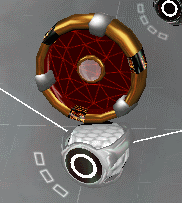 I just played a game where the code gate was linked to a core and sensor. The sensor had full AV the core none when I took the code gate my attacks went after the core and not the full AV sensor. Lucavious wrote: What's the attack priority of the core in this list? Lucavious wrote: What's the attack priority of the core in this list? I would this it's a white passive node, but it doesn't seem to behave that way. 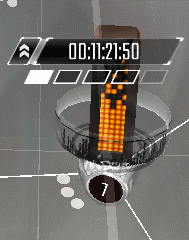 I just played a game where the code gate was linked to a core and sensor. The sensor had full AV the core none when I took the code gate my attacks went after the core and not the full AV sensor. Thank you for your great effort, Fluffington and and companions! I have tryed to change attack priority of 3 defense node by just cut one connection and retach it again at rebuild screen but it won't change attack priority. Seems have to save detached state and then retach again. Can anyone confirm this? Last edited by kuzu on Wed Nov 23, 2016 2:21 am, edited 2 times in total.